Today's guest post is by Jequeta Mullins Briskey. Jequeta was the youngest of 11 children and she grew up in Clintwood, Virginia. She didn't start writing until after she was married and most of her short stories are centered around growing up in southwestern Virginia. She currently lives in northwestern Ohio with her husband, John, and they have 3 children, 8 grandchildren, and 5 great-grandchildren. 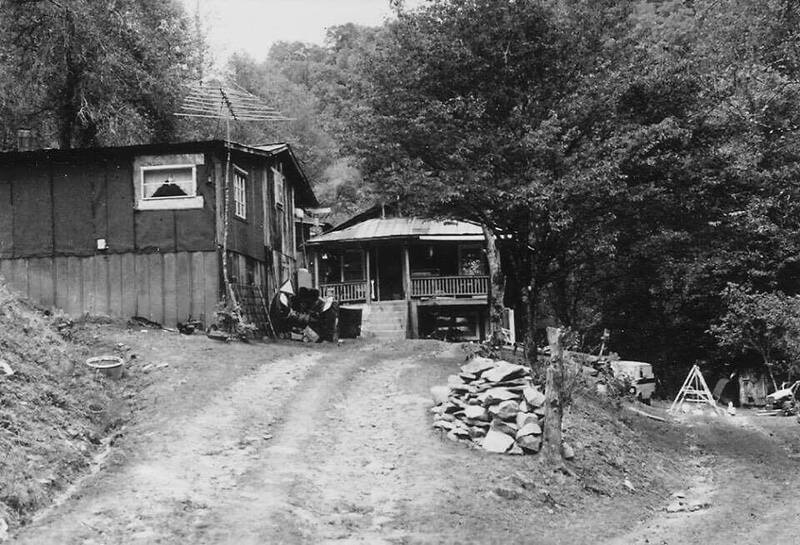 Jequeta's childhood home in Clintwood, VA.
By the time the morning sun topped the tree line on the ridge by our mountain home, everyone in our family had finished breakfast and moved on to their specific chores for the day. Breakfast came early at our house. We were to be up and ready to eat breakfast by 6:00 a.m. every day. Cows were waiting to be milked, hogs waiting to be slopped, chickens waiting to be fed, eggs waiting to be gathered and the family dog Rookie waiting for another adventure with my brother Johnnie. The girls had the inside chores like making beds, washing dishes and sweeping floors right after breakfast. Mom would usually be in the kitchen preparing to cook, can, freeze or bake anything that had been harvested from our gardens. Dad would be out on the mountainside working to keep down the weeds or burning off the trees, twigs, weeds or bushes as a way of strengthening up the soil to start yet another garden spot for more crops. We raised all the usual, including corn, beans, peas, lettuce, carrots, onions, beets, squash, pumpkins, watermelon, and okra (my least favorite). We also had fruit trees which included apple, pear, peach and papaw (which was dad's favorite). Growing wild in the area was blackberries, raspberries, gooseberries and ground cherries. Of course, my dad had his well known strawberry patch which I am sure helped clothe us and keep shoes on our feet throughout the year. After all our chores were done, we could run wild in the mountains as we pleased. Johnnie would take the dog Rookie and play his games of Cowboys and Indians. Joyce, Marline and I would never venture far from the house. We spent a lot of our time on the big front porch swinging and dreaming through the Sears and Roebuck catalog, planning our future. Many times there were interruptions of Mom calling us to come wash up some canning jars or churn up some buttermilk or help string some beans, or hang some clothes on the line. It seemed there was always something to do especially in the summer. The mountains held all the entertainment we needed. All around us were a multitude of lessons to be learned from experience. We learned early what was safe and what was not. Swinging on the wild grape vines that intertwined thorough the expanse of trees surrounding our home was something we could not resist, even with the warnings from our Mom that they were unsafe. We could always find something to snack on throughout the hillside. Mountain Teaberry is an experience that is beyond belief. Though the berries are hard to find and as hard to see, the taste is worth the effort of the search. If you have never heard of this treat, just imagine Teaberry Gum in its true organic form. We also could chew on birch bark from young birch trees. And though we had a huge strawberry patch at our disposal, we would gladly forego those to have strawberries growing wild in the mountains. And a cool mountain stream was never far away if we were thirsty. Rookie was our faithful watch dog and we could always tell by his bark whether there was an intrusive animal about or if a stranger was lurking around, or even if he had roused up a copperhead. The air in the mountains was clear and refreshing. The sounds of critters and crickets were always present. During the day, we could hear all kinds of birds including the woodpecker, the bob white and the ever present crow raiding our corn patch. Sometimes Mom would allow us the take out the old .22 rifle and shoot a warning shot to scare them away. However I am sure they ate more in corn than the cost of the shells we wasted. As dusk fell, we would watch and listen for the elusive whippoorwill. As night time grew we would all gather on the front porch and share the quiet of the evening with a chorus of croaking frogs in the nearby river. Two swings and many chairs, most likely home made, offered us comfort as we rested our bodies from the days work. In the cooler evenings. we would have a quilt to work on instead of sitting outside. I have spent many hours sitting with my dad on that front porch watching a thunder storm move into the area or move off into another direction as the rain fell and serenade us with the gentle sound of nature. As summer drew to a close we would find a new crop of treats out in the mountains. Chinquapins, beech nuts, butternuts as well as black walnuts were plentiful. The cooler autumn days drew us deep into the mountains searching for ginseng which we dug, brought home to dry and sold for a nice price. We never knew for sure where this ginseng ended up but we sure enjoyed the search for the big red berries that honed us in to that much sought after treasure. As the days marched on and the winter winds blew, we could bring summer time back again by opening up a quart of green beans or corn from our can house or a pint of frozen strawberry jam from the freezer. We knew the mountains awaited us for yet another year of work and pleasure as we enjoyed summer in our Appalachian Mountains. I hope you enjoy this short story as much as I did! I look forward to sharing more from Jequeta in the future.